This PowerPoint is about the TPM that Toyota involves the operator in training in machine maintenance. This PowerPoint also includes the requirements for a successful TPM Introduction. Often referred to as "total production maintenance" or "total productivity maintenance", the formal name for the TMP Toyota introduced is "Total Productive Maintenance". That is the method of training operators to get involved in maintenance task too. This PowerPoint will help you to investigate if the introduction of TPM will help you reduce lost time on operating equipment to a tune of 30% or better. Which is typical for plants who do not already have advanced Preventive Maintenance and Predictive Maintenance PdM practices in place. This PowerPoint will also help to insure you meet the requirements for a Successful TPM introduction to your facility. As author Mike Sondalini puts it "Too many times TPM fails in a company because the operators and maintainers, who are meant to deliver TPM to their equipment, are not involved in its implementation. 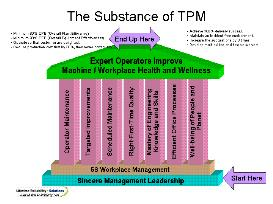 Rather they get told to ‘do TPM’, and management then wonders why TPM doesn’t work for them." To make the presentation fun to read, the PowerPoint is designed for th reader to follow Ted, the Maintenance Planner, and Jim, the Lead Operator, as they learn about TPM and what needs to be done to use TPM on the equipment in their operation. If you do not already have a successful PM and PdM system in place. If you want to learn how TPM can help you. If you have a TPM in place but it is not meeting your expectations. If you want to increase your facility's throughput. Total Productive Maintenance is a philosophy for producing 100% quality product, on-time by making sure the production equipment used to make the product operates perfectly. TPM is the result of developments by Japanese researcher Nakajima, and his students, in the 1960’s when Nippondenso started to apply Just-in-Time manufacturing in response to Toyota’s demand for lower cost, higher quality parts. Definition: Total Productive Maintenance TPM is an equipment management program that emphasises operator involvement and ownership of equipment performance. The goals of a TPM program are to maximise equipment productivity, maximise equipment availability and make quality product by eliminating causes of equipment defects, losses and wastes through expanding and engaging the knowledge, skills and abilities of the front-line people running the process. Throughout the course you will do activities from the accompanying Workbook that provides the opportunity to learn and discuss numerous issues and perspectives to do with Total Productive Maintenance and it's successful implementation. 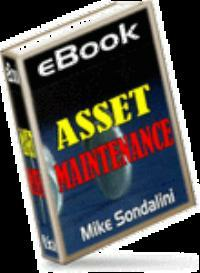 Introducing Total Productive Maintenance TPM. Free Trainee Assessment and Achievement Certificate offer at end of the workbook. Price: US$19.99 85 slides, plus a 19 page workbook!